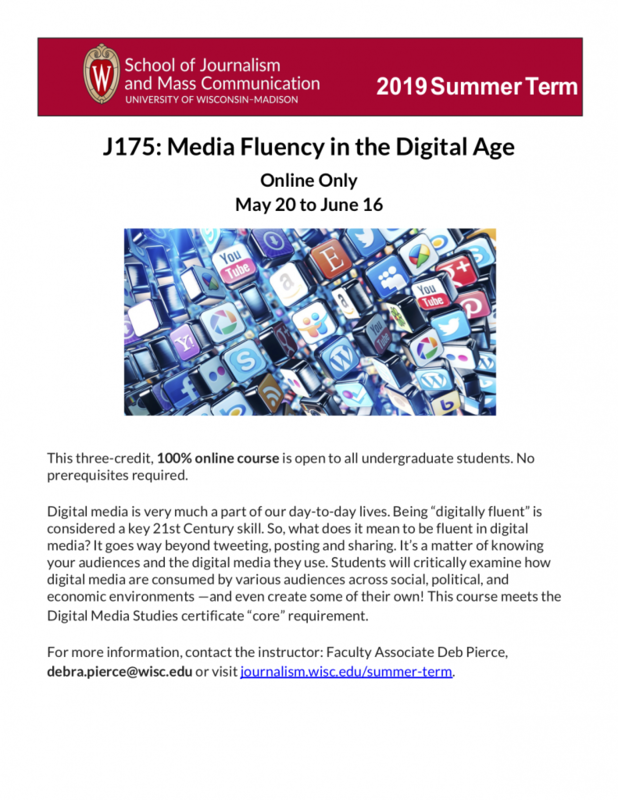 If you’re thinking of doing the digital studies certificate, you should look into taking J175: Media Fluency in the Digital Age this summer. It runs from May 20 to June 16 — the best part is that it’s entirely online and self-paced, so you can take it from anywhere, even while you work or do an internship. It’s also a core course for digital studies, so it’s a chance to make progress on the certificate. I’ve got a change to my normal office hours today. If you want to come see me, I’ll be in Vilas 2122 (lucky Lab 306!) and available between 1 and 2:50 p.m. Please swing by to grab me, and we can find a place to talk. Otherwise, you can find me Monday at noon in the J202 labs or next Thursday from 11:30-12:30 over in the Grainger Learning Commons. Keep working away at your projects — you’ve made amazing progress so far! Here’s a link to the PDF of the slides Steve Horn used when he spoke to our class. You can earn extra credit for going to up to five professional practice events. (You already went to two for your portfolio blog, but you can earn extra credit for things you attend on top of that.) When you go, be sure to fill out the form with a few lines about what you learned. You can also do one of the online courses posted on March 13 for extra credit. And if there’s something you want to attend and there’s a media connection, send me an email to confirm it would qualify. Remember you must fill out the extra credit form for ALL of the events you attend, whether they count for the portfolio blog or extra credit.